SERGE ATTUKWEI CLOTTEY. “AWAKEN IV” (2018). PLASTICS, WIRES AND OIL PAINT. 44 X 49 IN. PHOTO: NII ODZENMA. Famous artists are often a reflection of the societies that celebrate them. It’s hard to separate the prominence of Warhol from the rise of advertising; difficult to extricate our image of Basquiat from the graffiti-strewn urban landscapes that spawned him; nigh impossible to extricate Duchamp’s urinal from the French people’s taste for the sexually subversive and absurd. In which case, what to make of the rise of Ghanaian artist Serge Clottey, in today’s context? What might his newfound, burgeoning celebrity say about our global society, its priorities and its values? In every age except for ours, it may have seemed less-than-feasible that a multimedia artist from Accra (pop. 1.5 million) could acquire major exhibitions across the world, features in major magazines, and name cache that leads to his works—many of which are composed out of small bits of plastic waste—selling at median five-figure prices. Of course, our age is unlike any other, and Clottey’s work reflects the increasingly hot, flat, and crowded psychological landscape we all share. SERGE ATTUKWEI CLOTTEY. “GOOD JUDGEMENT” (2018). PLASTICS, WIRES AND OIL PAINT. 66 X 51 IN. PHOTO: NII ODZENMA. This is a fitting summation of the 33-year-old artist’s work. Clottey first acquired the attention of Western collectors and gallerists by using Instagram and email to showcase his work, which contains a blend of paintings, performance, sculpture, and quilting. The most common feature of these disparate practices is their employment of what Clottey has called ‘Afrogallonism’—the use and re-appropriation of yellow plastic “Kufuor gallons,” colloquially named after the president at the time, John Kufuor, whose administration distributed the jerrycans en masse across the Ghanaian population in order to be used as vessels for cooking oil, though they were later repurposed in countless ways. As one might imagine, most of these cans became chemical-laced waste, littering Ghanaian townships and cities, and it was these pieces of ‘waste’ that a young Clottey began using as makeshift canvasses over 17 years ago. SERGE ATTUKWEI CLOTTEY. “NOTHING ELSE MATTERS” (2018). PLASTICS, WIRES AND OIL PAINT. 53 X 88 IN. PHOTO: NII ODZENMA. Sometimes, Clottey incorporates these gallon cans with traditional African ceremonial dress; other times, he uses them in performance, like when he built Kufuor gallon bridges across lagoons in his beachside Accra neighborhood. His radical re-interpolation of the ubiquitous object is often aided by the hands of his GoLokal collective—a grassroots group of Accra citizens who have banded, one at a time in growing number, with Clottey to help construct his recycled flights of fancy. Most recently, one such project was entitled “Follow The Yellow Brick Road”: an installation of Kuofor gallons that covered the streets of Accra, leading the way to the neighborhood of La, where the GoLokal collective have their headquarters. As always with Clottey’s work, the installation had a critical bent—Clottey told the BBC in August that the work was about property rights, and the sad fact that many of the residents of developing communities in Africa cannot prove land ownership because they do not have the proper papers, and are therefore targets for exploitation. Other times, his work challenges traditional notions of gender and propriety. As part of his project My Mother’s Wardrobe, men and women in Clottey’s retinue donned the inherited clothes of their mothers as they marched through the city; following the death of his own mother, Clottey wanted to challenge a central tradition In Ghana, wherein the clothes of the mother are handed down to her daughters after a year of being stowed away. As an only child and active opponent of the status quo, Clottey took an opportunity to both honor his mother and the broader community of women who are so central to the African family structure. SERGE ATTUKWEI CLOTTEY. “YESTERDAY AND TOMORROW” (2018). PLASTICS, WIRES AND OIL PAINT. 99 X 75 IN. PHOTO: NII ODZENMA. 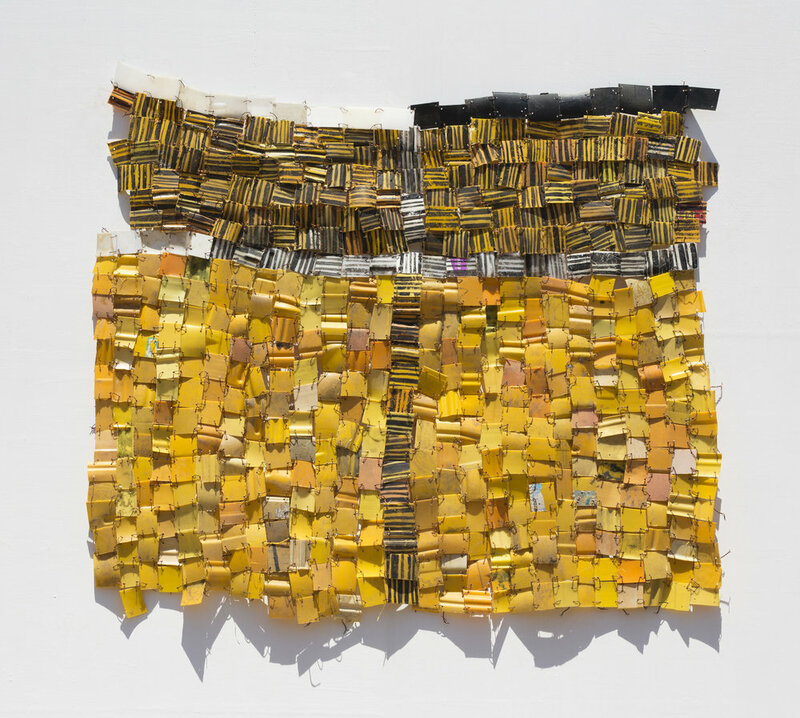 Though the work of Clottey and his collective is indeed wide-ranging, there is one form of their work that is most commonly cited—rectangular, quilted mosaics constructed with cut-up bits of Kufuor gallons, usually bound together with wire. One Google image search of the name ‘Serge Clottey,’ and you will be confronted with countless images of these works. If you picture them hanging, as they have, in galleries from California to London, it is not hard to imagine these objects—constructed from Western plastic and imported to developing nations in a poorly planned administrative effort, then discarded and re-issued within a Western art space—changing their value and meaning. If Clottey is true in this aim, and his work is truly intended as a global endeavor of consciousness-raising, then the art world may be forced to consider some uncomfortable truths. Given that Clottey comes from Ghana, one of 20 nations to receive a ‘very vulnerable’ rating from a Standard and Poor evaluation of climate change impact, and that he works with materials that are part and parcel of our own disposable, plastic-oriented Western ways, the reflection his work holds up to us may not be the most pleasant one—even if his work is often, at base level, aesthetically gorgeous. Serge Clottey is an artist turning “global ideas” into visceral feeling. An artist that, if celebrated appropriately, may just reflect something redemptive about our time, and our society.